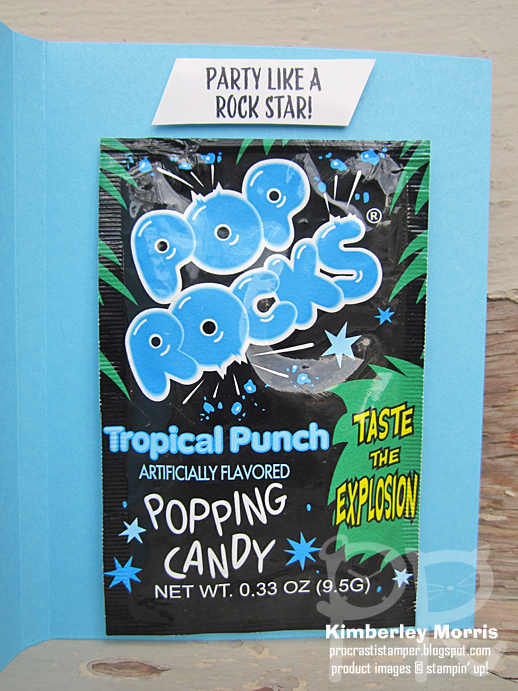 The card is pictured above in the Gift Box that came with the Giftable Greetings Paper Pumpkin Kit, it has a clear lid. The bag is from one of the envelopes included in the kit. 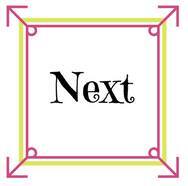 I worked out my project so you could make 6 cards with this pattern, and then you put them in the gift box, along with 6 of the included envelopes (3 each of 2 colored stripes). 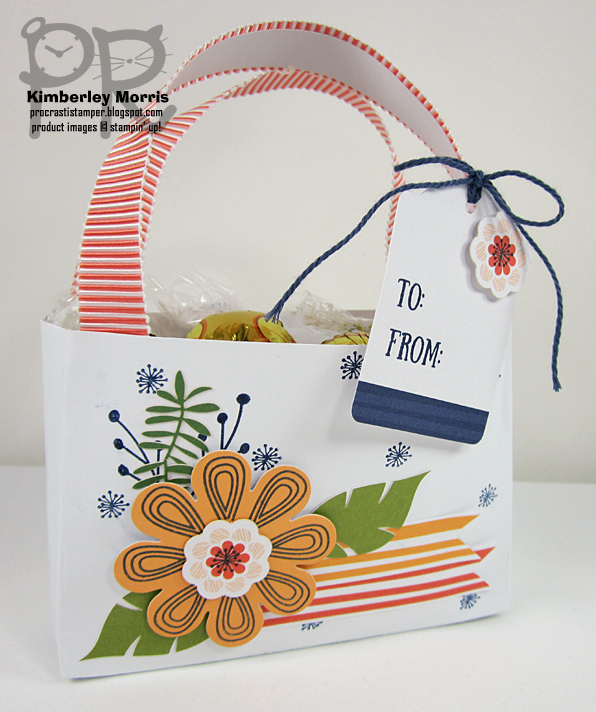 That would then leave 2 envelopes from the kit, with which you can create 2 of these gift bags! I cut the included ribbon in half, then cut each piece in half again so I'd have two pieces for the handles of each bag. To get the handles to stand up a little better, I used some of the Whisper White card stock I had cut away from the card bases, and adhered them to the back of the ribbon with Fast Fuse. Stampin' Supplies: August 2017 Giftable Greetings Paper Pumpkin Kit, Pool Party Card Stock, Fast Fuse, Mini Glue Dots. You can grab the Giftable Greetings Refill Kit on the PAST KITS page in my Online Store (as long as supplies last). This includes the consumables only, which is everything but the stamp set & ink pads. 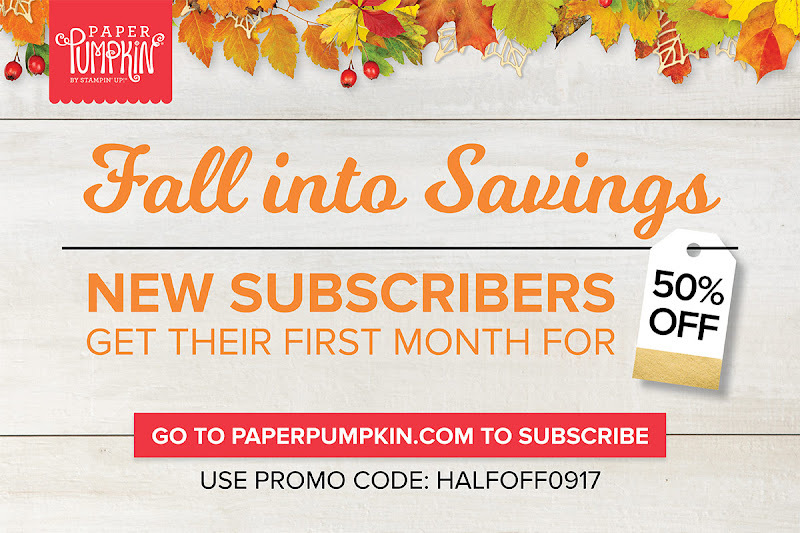 By the way, you're gonna have to be a Paper Pumpkin subscriber to buy whatever's available, so go ahead and sign up HERE to get your email address in the system first! NEXT UP: Click the Next button below to see Monika's giftable ideas! 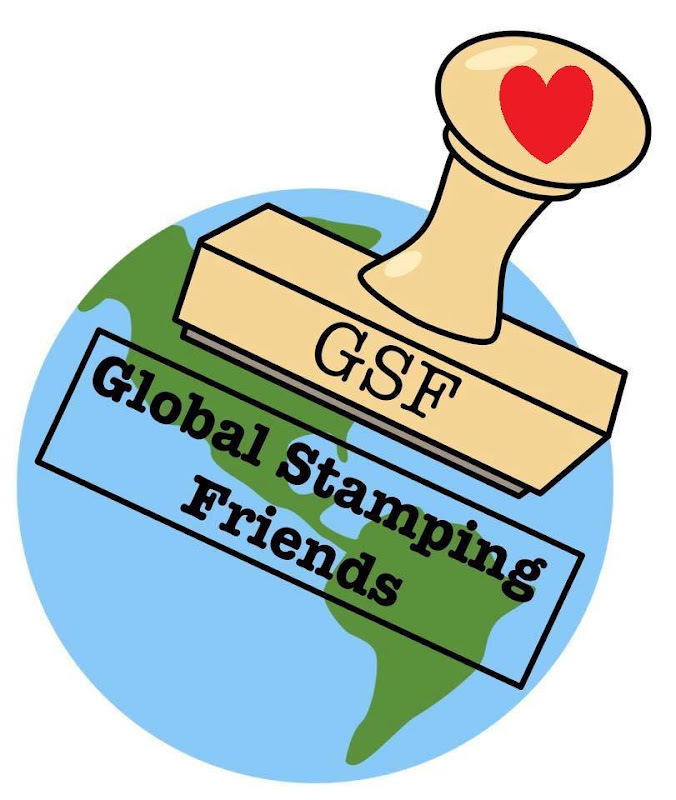 Global Stamping Friends Blog Hop - One Year Anniversary! If you don't like your handwriting, you could always stamp the greeting inside using the Labeler Alphabet stamp set. 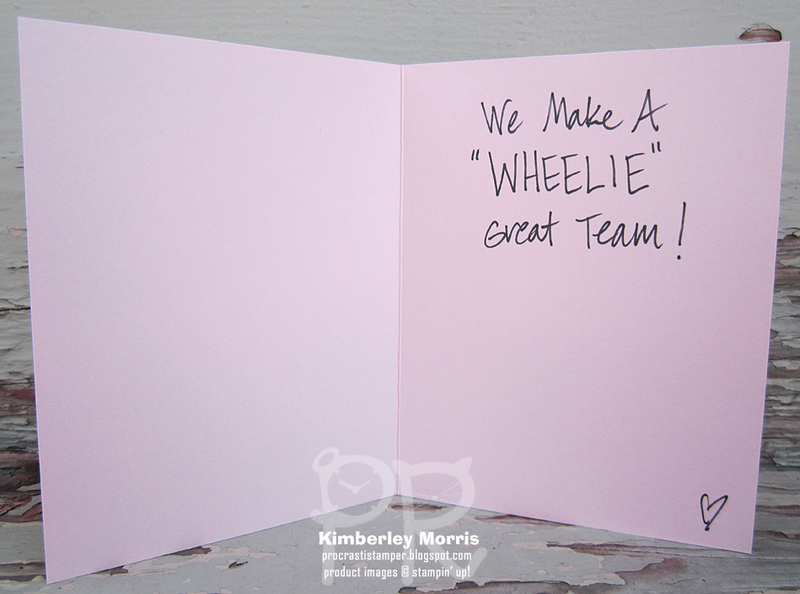 I'd use the reverse/block letters in the set for the word WHEELIE, and the regular letters for everything else. You could also use the One Wild Ride stamp set to make a similar version of this card, as the motorcycle in that set would take up nearly the same space on the front of the card. I also used the Watercolor Pencils and Blender Pens under the "ground line" I made on the card--which I made with a Sharpie marker so the fluid of the Blender Pen would not smear it. There's a Basic Gray pencil in the Watercolor Pencils set, so it was pretty convenient for color coordination! There are a couple of details you might not notice on this card, they are kind of subtle. 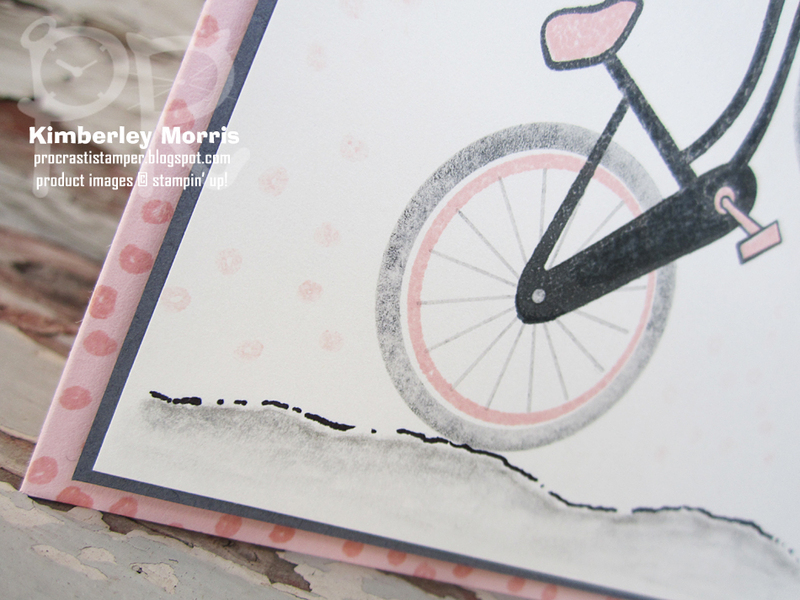 First, I used the Basic Gray Archival Ink Pad for both the body of the bicycle, and the tires. For the body, I used full strength ink, and for the tires, I stamped off one time gently so the color would be lighter. Also, in the background of the Very Vanilla card stock panel, I stamped the image of a group of dots from the Number of Years stamp set using the Powder Pink Ink Pad--also stamped off one time so the dots are very light. I also stamped those same dots, this time in full strength, around the edge of the Powder Pink Card Stock of the card base. 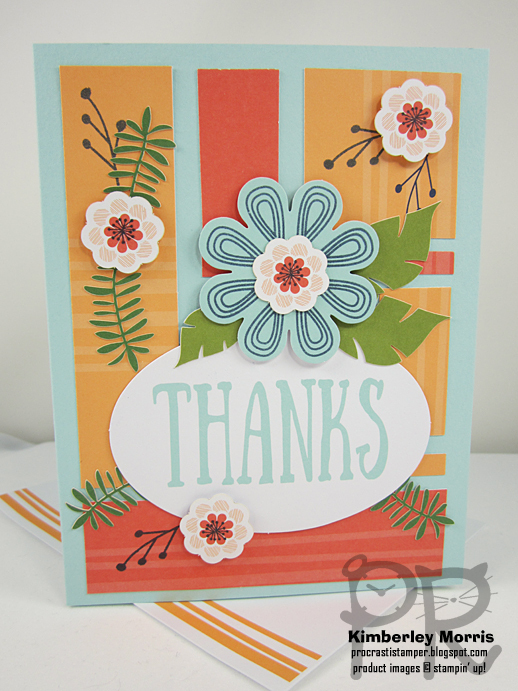 These are just simple ways to add a little bit of visual texture and interest to the card. As a side note, the Bike Ride stamp set coordinates with the Build a Bike Framelits, and you can get BOTH the stamp set and the framelits in this BUNDLE at 10% OFF! 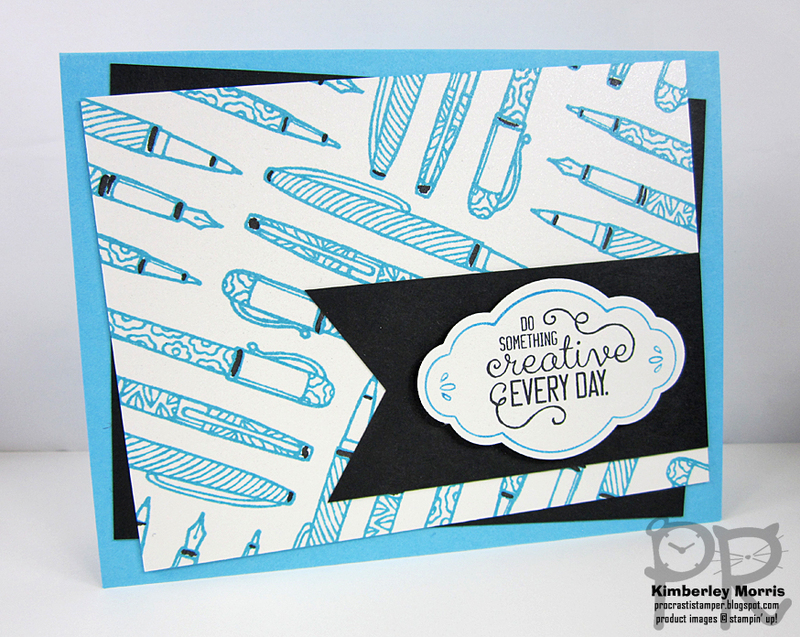 Oh, and don't forget to sign your work, people ;-) This image from the Crafting Forever stamp set is perfect! 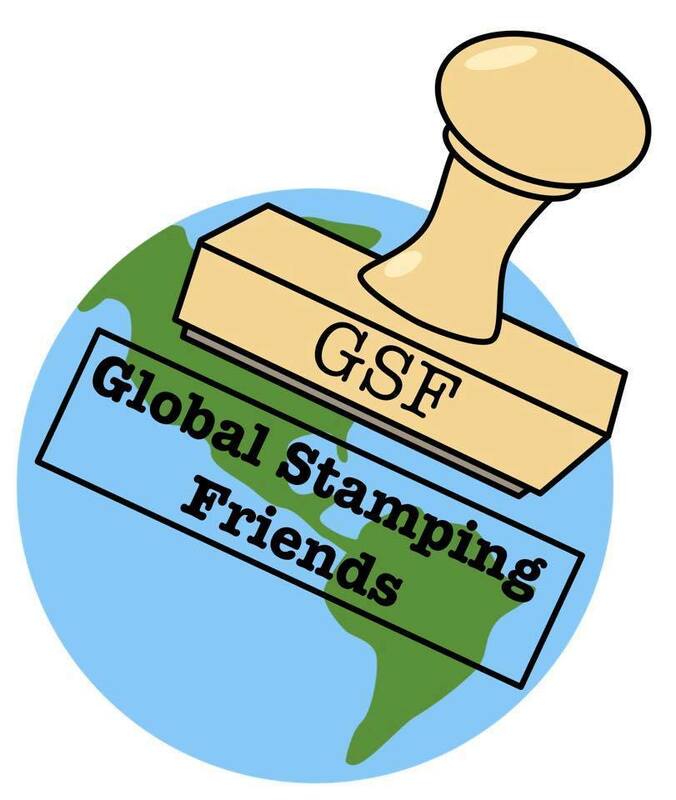 The set is available in wood-mount or cling-mount, but I knew I'd be using this one stamp ALL the time so I got it in wood-mount so I can set it on my stamping desk and it's always ready to go! 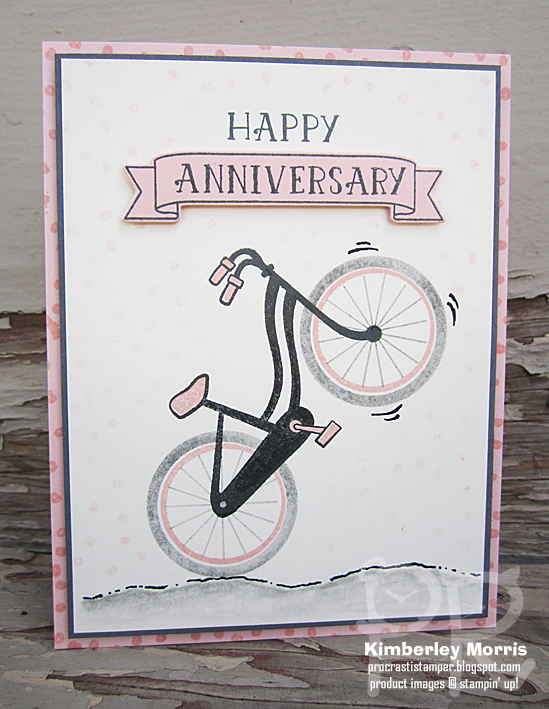 Stampin' Supplies: Bike Ride stamp set, Number of Years stamp set, Crafting Forever stamp set, Very Vanilla card stock, Basic Gray card stock & Archival ink pad, Powder Pink card stock & ink pad, Watercolor Pencils (Basic Gray for ground shadow), Blender Pens, Large Numbers Framelits, Fine Tip Permanent Marker (I used Sharpie for the ground line, wheel motion lines, and to write inside the card). 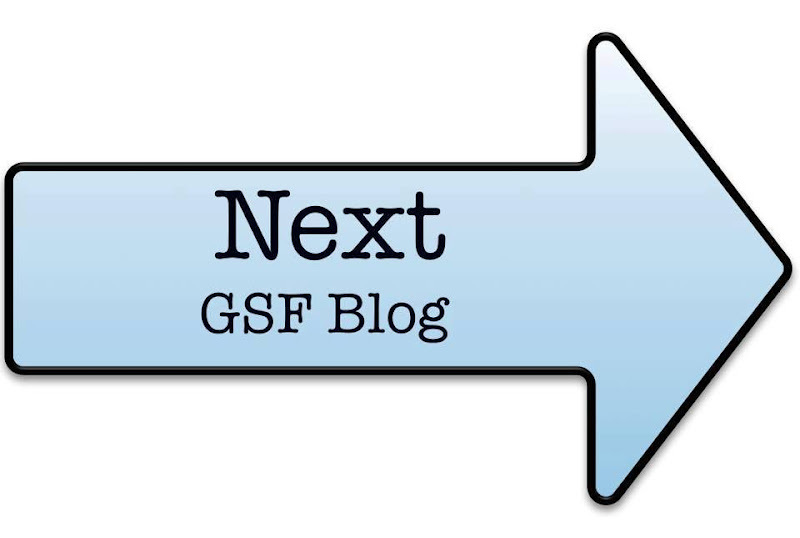 Click the Next arrow below to see Sarah's superb celebratory creations! 20. Kimberley Anne Morris YOU ARE HERE! I kept my basic version pretty simple, mostly straight stamping. 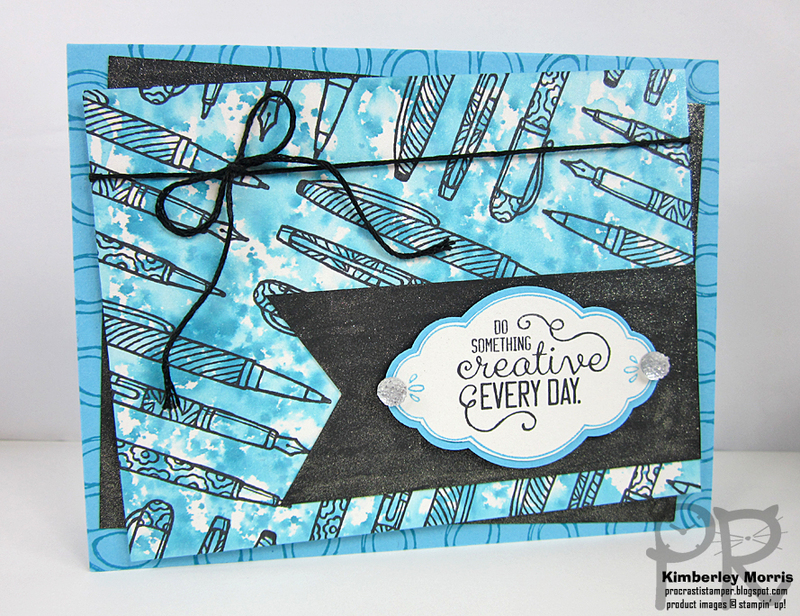 I did add some little highlights to the pens in the background with a Basic Black Stampin' Write Marker. 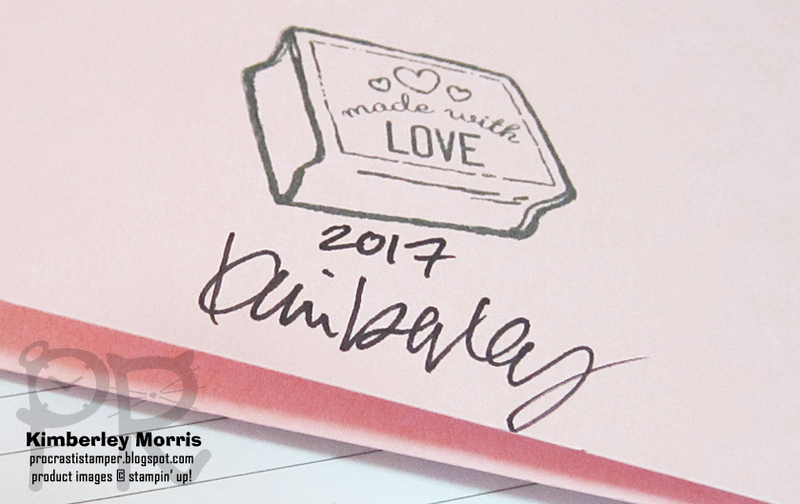 I also used a label outline from the Label Me Pretty stamp set (wood-mount or cling-mount), but I didn't want all the details from the image, so I inked up the parts I wanted with a Tempting Turquoise Stampin' Write Marker. The flexibility to do precision inking like that is one reason I had to have the entire set of the Many Marvelous Markers. To get the saying right smack in the center of the label outline where I wanted it, I used ye olde Stamp-a-ma-Jig...an oldie, but a goodie. 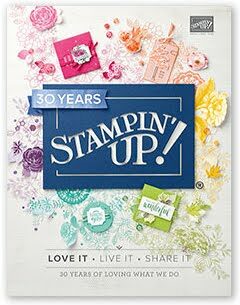 Stampin' Supplies: Crafting Forever stamp set, Label Me Pretty stamp set, Shimmery White card stock, Tempting Turquoise card stock/ink pad/marker, Basic Black card stock and Archival ink pad, Pretty Label Punch, Triple Banner Punch, Stamp-a-ma-Jig. 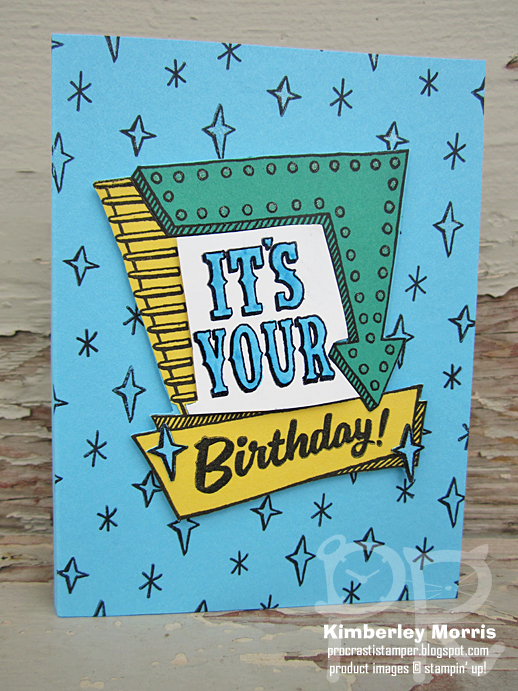 For my "stepped up" version, I created sort of an ink-splotchy background on the Shimmery White card stock. 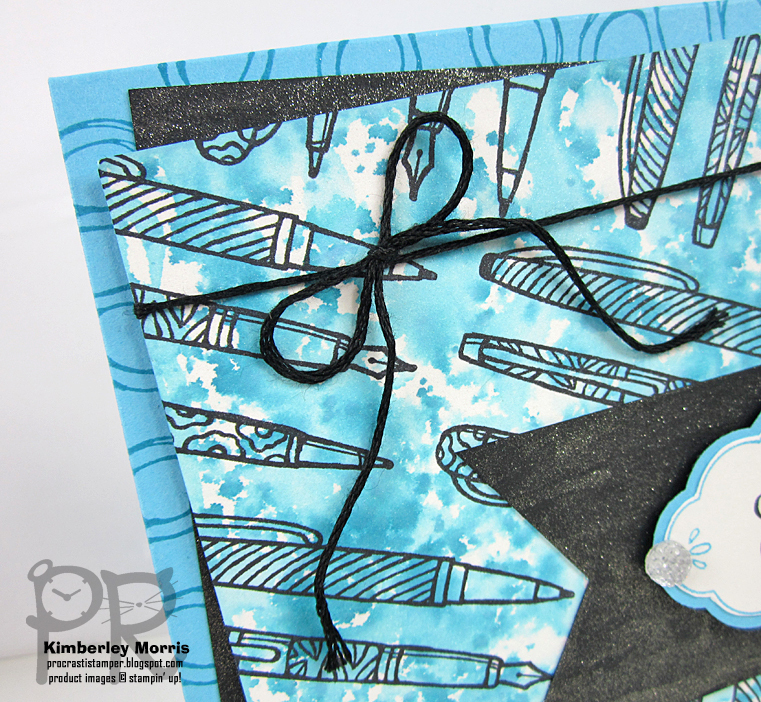 You can see I stamped around the edges of the card base with the finger loops part of the scissors image that's in the Crafting Forever stamp set, to add a little interest. I also went around the edges of the Basic Black card stock layer, and over the entire banner layer, with Clear Wink of Stella, to give both those parts some glimmer. It looks pretty smooth in person, even though the lighting on the picture makes it look like there are textured lines. Then I bumped up the bling a little more with some Clear Faceted Gems. You can see the background a little better in this closeup. First, I wet the Shimmery White card stock with water from a Stampin' Spritzer. Then I dropped a few drops of Tempting Turquoise reinker into the lid of the Tempting Turquoise ink pad (for a palette), and used a wet Aqua Painter to pick up some reinker. I then held the Aqua Painter over the card stock and tapped the Aqua Painter, and splotches came flying off and landed on the card stock. I squeezed a little more water from the Aqua Painter when I wanted the color lighter, and I went back and dabbed the tip of the Aqua Painter back into the reinker puddle when I wanted the color darker. I set my card stock piece down into a clear shoe box, so I could reach down into there to splatter, and then I just rinsed out the plastic box afterwards. You can wait for the card stock to air dry, or use a Heat Tool...but if you do the latter, be sure to alternate the heat on the front of the card stock, then the back, then front, back, etc., as you're drying, to minimize warping. Stampin' Supplies: Crafting Forever stamp set, Label Me Pretty stamp set, Shimmery White card stock, Tempting Turquoise card stock/ink pad/marker/reinker, AquaPainter, Stampin' Spritzer, Basic Black card stock and Archival ink pad, Pretty Label Punch, Triple Banner Punch, Clear Faceted Gems, Clear Wink of Stella, Basic Black Solid Baker's Twine, Stamp-a-ma-Jig.